Equatorial corals were previously thought not to spawn synchronously at the assemblage level. However, recent studies have reported multi-specific coral spawning events in equatorial regions. Here, we report the reproductive activity of 21 Acropora species in the Karimunjawa Archipelago over five consecutive years (2008–2012). We also infer the month of spawning for Acropora humilis, Acropora gomezi, and Acropora muricata from the presence of mature oocytes. We found that Acropora assemblages exhibit a high degree of inter-specific reproductive seasonality. The highest proportion of colonies with mature oocytes was observed in March 2011 (65%, n = 80). Oocytes likely developed during June–March, 6 to 10 months before spermatogenesis. Spermatocytes were observed in samples collected during March; however, the onset of spermatogenesis could not be precisely determined as samples were not collected in January and February. This was because of weather constraints and difficulty in detecting the early stages of spermatogenesis. Multi-specific spawning events were observed during the first transition period (March–April) and the second transition period (September–October) between monsoons. The number of species containing mature oocytes was higher during March–April (12 species) and September–October (8 species). Spawning patterns likely follow the lunar cycle. However, two distinct spawning events coincided with two periods of higher temperature (March–April and September–October). Daily temperature records indicate that spawning occurred on days where temperature dropped before the expected spawning time during the warming period. During the period of rising temperature, wind speeds were lower, which might serve as a signal leading to the multi-specific spawning of corals in the tropics, at least in the Karimunjawa Archipelago of Indonesia. Knowledge on the timing of spawning within coral assemblages has developed rapidly in recent years, and this phenomenon has now been documented at more than 25 locations globally (Baird et al., 2009; Kongjandtre et al., 2010; Bouwmeester et al., 2011; Chelliah et al., 2015). This phenomenon has been documented over a wide geographic area, including remote regions, such as New Caledonia (Baird et al., 2010), the Persian Gulf (Bauman et al., 2011), Yemen (Baird et al., 2014), and the southern-most reef of Lord Howe Island, Australia (Harrison, 2008; Baird et al., 2015). The reproductive patterns of corals vary widely during spawning, with wide variations existing in the intensity of spawning, extent of reproductive synchrony, and duration of the spawning period, both within and among coral populations at different locations (Harrison, 2011). However, the reproductive mode of most coral species is generally consistent and conserved. For example, most acroporids are hermaphrodite broadcast spawners throughout their distribution range (Baird et al., 2009). It has been previously suggested that multi-specific spawning events only occur in the Great Barrier Reef (GBR), Australia. Existing studies suggest that populations that do not experience large environmental fluctuations, such as corals at low latitudes, exhibit less synchronous spawning (Shlesinger and Loya, 1985; Oliver and Willis, 1987; Oliver et al., 1988; Harrison and Wallace, 1990; Richmond and Hunter, 1990). However, multi-specific spawning has been observed in the Solomon Islands (Baird et al., 2002), Singapore (Guest et al., 2002, 2005a), the Java Sea (Edinger et al., 1996; Permata et al., 2012) and Western Australia (Gilmour J. et al., 2016). Thus, equatorial coral assemblages might exhibit a higher degree of coral spawning than previously assumed. Lower reproductive synchrony in corals at low latitudes has been recorded in the coral reef communities of Kenya, where most corals exhibit a greatly extended reproductive period (Mangubhai and Harrison, 2008). This finding triggered debate over using latitude to define variation in “mass spawning events” and “multi-specific species spawning” (Baird and Guest, 2009). In particular, a recent report suggests that corals in East Africa, a low latitude area, exhibit synchronous spawning periods (Sola et al., 2016). Synchronous spawning within coral species is required to facilitate cross-fertilization. Sperm dilution represents a major constraint that decreases fertilization success when small colonies spawn synchronously (Levitan et al., 2004). As a result, many broadcaster corals spawn at predictable times every year (Willis et al., 1985). This phenomenon maximizes the fertilization rates of gametes in the water column (Guest et al., 2005b). Various environmental factors might contribute to the timing of reproduction in corals, the control of the reproductive activity, at both proximate and ultimate levels (Harrison and Wallace, 1990). Babcock et al. (1986) suggested that environmental factors operate at progressively finer scales to regulate the time of year, the night, and the hour of spawning. Sea surface temperature (SST) might serve as the major seasonal cue to synchronize the maturation of most corals during the reproductive cycle. Broadcast spawning corals spawn their gametes during periods when water temperature is rapidly changing (Indo-Pacific region) or is close to its annual maximum (Western Atlantic region) (Harrison and Wallace, 1990; van Woesik et al., 2006; Keith et al., 2016). For example, coral populations at inshore and offshore reefs in the central region of the GBR spawn 1 month apart, corresponding to the rise in SST that occurs 1 month earlier in inshore reefs (Harrison et al., 1984; Willis et al., 1985; Babcock et al., 1986). However, other relationships between SST and spawning time are less well understood (Baird et al., 2009). For example, while most corals in the Indo-Pacific region spawn in spring during periods of rapidly increasing temperatures, some corals in western Australia spawn during fall when temperatures are rapidly decreasing (Rosser, 2013; Keith et al., 2016). While the peak in coral spawning might be best predicted by rapid seasonal changes in sea temperature, other factors might control the timing of coral spawning, such as insolation and wind speed (Mendes and Woodley, 2002; Penland et al., 2004; van Woesik et al., 2006; Baird et al., 2009). In tropical and equatorial regions, the role of environmental factors in the reproductive scheduling of tropical corals remains unclear. Multi-specific spawning has been observed in these regions, despite a lack of strong fluctuations in the environment. In Mozambique, coral assemblages spawn during periods of rising SST and low wind and rainfall (Sola et al., 2016). In Singapore, spawning of the coral Platygyra pini follows periods of increasing monthly SST (Guest et al., 2012). Similarly, in Kenya, spawning peaks during periods of rapidly rising SST (Mangubhai and Harrison, 2008). Mendes and Woodley (2002) suggested that the spawning timing of Orbicella annularis in the Western Atlantic is controlled by a combination of temperature and monthly rainfall. These studies suggest that spawning synchrony does not break down at low latitudes. Despite lying at the center of coral biodiversity (Veron et al., 2009) and harboring a high coral diversity of 580 scleractinian species (Burke et al., 2002), very few studies have focused on coral reproduction in Indonesia. In October 1995, Edinger et al. (1996) first documented 22 scleractinian species spawning over a three-night period following the full moon in the Karimunjawa Archipelago. Permata et al. (2012) observed biannual multi-specific spawning at the same location. Furthermore, Bachtiar (2001) reported spawning of Acropora cytherea and A. nobilis around Lombok between January and February after full moon, whereas Hydnophora rigida released gametes biannually in March and October after full moon. Baird et al. (2005) reported that Acropora species from Aceh sampled in March were gravid, as were Acropora assemblages from Seribu Island, Jakarta Province, and Nusa Lembongan, Bali. Thus, these corals probably spawned in March and April. A later study by Baird et al. (2009) found that Acropora species from Makassar and Manado contained mature oocytes in October. In the current study, we document the extent of reproductive activity of Acropora assemblages from Karimunjawa Archipelago in the Java Sea of Indonesia, over a 5-year period (2008–2012). Gametogenesis was examined during the first year (2008), and the spawning activity of Acropora assemblages was monitored over the subsequent years (2009–2012). Potential environmental predictors of the timing of coral spawning, such as SST and rainfall, were examined (Mendes and Woodley, 2002). All surveys and sampling in this study were conducted on a cluster of three islands (Sambangan, Seruni, and Genting Islands) in the Karimunjawa Archipelago, which is located about 80 km northwest of Jepara, Central Java (Figure 1). Samples were collected for subsequent histological analysis at a depth of approximately 2–7 m on Sambangan Island, specifically at Taka Fadelan, which is a reef lagoon (05°50′ 42.5′′ S, 110° 35′ 17.7′′ E), and at Ocean Base, which is an outer reef (05°50′ 40.1′′ S, 110° 34′ 48.5′′ E). Surveys of reproduction were conducted at the same two sites, as well as at a site on Seruni Island (05°51′ 57.5′′ S, 110° 35′ 24.8′′ E) and another site on Genting Island (05°51′ 17.6′′ S, 110° 36′ 37.9′′ E). All surveys and sampling on Seruni and Genting Islands were approved by Karimunjawa National Park under permit number 889/BTNKJ-1.6/SIMAKSI/2008. The research permit for Sambangan Island was obtained from PT Pura Baruna Lestari, which is an organization that privately manages the island. Figure 1. Study sites. Sambangan Island, Genting Island, and Seruni Island, cluster of three islands about 15 km from main Karimunjawa Island and the study location of sampling sites; 1, Taka Fadelan; 2, Ocean Base; 3 Reef Lagoon of Seruni Island; 4 Outer Reef of Genting Island. Samples were collected from all three islands for subsequent histological analysis to document gametogenesis in Acropora species and to determine spawning times. Sampling was conducted once a month from May 2008 to March 2009 at Taka Fadelan and Ocean Base, which were both near Sambangan Island. However, due to weather and logistical constraints, sampling was not conducted in November 2008 and January and February 2009. The branches of three species (Acropora gomezi, A. hyacinthus, and A. humilis) were used as samples, and were cut using pliers. Five to 10 colonies of more than 20 cm diameter for each species were tagged at each study site. Branches were sampled from the center of the colony. The branches were broken 2–3 cm below the tip in corymbose and tabular colonies and 8–10 cm below the tip in arborescent colonies. This sampling approach was used to avoid sterile zones (i.e., areas of the colony with no gametes) that generally occur at the perimeter of colonies and the tips of branches, which tend to represent areas of recent growth (Wallace, 1985). Within 30 min of collection, branch segments were fixed in 10% formaldehyde in seawater for 24 h. The fixed branches were decalcified in a 1:1 mixture of 10% acetic acid and 10% formaldehyde in tap water for approximately 2 weeks. Tissue was dissected and cut into 1 cm × 1 cm pieces which were then dehydrated in a graded series of ethanol and cleaned using xylene. Tissues were embedded in paraffin and 6–8 μm sections were cut and stained with Delafield’s hematoxylin and eosin (Permata et al., 2000). Histological sections were observed under a light microscope (Nikon Labophot-2, New York, United States). Each colony was then classified into one of four stages of oogenesis or spermatogenesis (Harrison and Wallace, 1990; Vargas-Ángel et al., 2006 and Supplementary File S1). Oocytes of >300–800 μm in size were classified as the mature stage. Mature oocytes are packed with yolk granules, stain deeply, and have an indented nucleus. By comparison, spermaries are packed with mature spermatozoa that have developed tails and are approximately 80 μm in size (Vargas-Ángel et al., 2006). To measure the size of oocytes and testes, sections that contained the maximum planar area of the oocytes and testes, respectively, were selected and photographed under the microscope using an Olympus A80 digital camera. The diameter of oocytes and testes was measured using Adobe Photoshop version3.0 software. Oocytes and testes were measured using a size index, with a geometric mean of the short and long axes of the section of oocytes and testes (Permata et al., 2000). Monsoons create four distinct seasons in the Karimunjawa Archipelago (Tomascik et al., 1997): southwest (SW) monsoon (wet season, November–February); northeast (NE) monsoon (dry season, May–August); first transition period (March–April); and second transition period (September–October). To determine the reproductive condition of Acropora corals, surveys were carried out during the first transition period before the southeast monsoon (wet season) from February or March in 2009–2012, and during the second transition period before the northeast monsoon (dry season) from September or October in 2011 and 2012. Sampling was conducted 1 to 3 weeks before the expected spawning date, which occurs between 1 and 8 days before full moon. Sampling periods are listed in Table 1. During each sampling period, two scuba divers conducted three surveys each by swimming parallel to the reefs for a distance of approximately 100 m. Samples were only taken from colonies greater than 10 cm in diameter to increase the likelihood that the colonies were mature enough to produce gametes. Colonies were tagged before branches were collected, to avoid re-sampling in a given sampling period. To avoid sampling clones, sampled colonies were located at least 1 m apart. Some Acropora species were identified in situ, while unidentified species were further analyzed following bleaching in the laboratory and observation under a microscope to detect species-specific skeletal patterns, as per Wallace (1999). The reproductive condition – was established by breaking coral branches using cutting pliers and exposing the developing oocytes, as described by Harrison et al. (1984). Three branches were broken off from each colony to reveal the status of oocyte development based on the pigmentation of visible oocytes. It was assumed that mature oocytes would release gametes within 1 month and immature oocytes would release gametes within 2 months. In comparison, the absence of visible oocytes indicated that they had already spawned or that the oocytes were too small to be detected with the naked eye and, thus, would not spawn for at least 2 months (Baird et al., 2001, 2011; Guest et al., 2005a; Gilmour J.P. et al., 2016). The four sampling sites were surveyed during each sampling period. Data were pooled for each spawning season during the first and the second transition periods. Colonies containing mature or immature eggs were collected from the study sites and maintained in aquaria during each of the transition periods from 2009 to 2012 to determine the timing of spawning. The aquaria were checked every morning for gametes that were released overnight. If a colony had spawned its gametes in the aquaria or if a “fishy” smell was detected at sea, tagged colonies in the field were visited within 24 h and intensely observed during and before spawning hours. The tagged colonies were visited again the next day. In 2010, spawning could not be directly observed owing to weather and transportation constraints. Instead, spawning was inferred from slicks [the corals-egg-sperm bundles that are released during multi-specific coral spawning events (Oliver and Willis, 1987; Heyward and Negri, 1999)] deposited on the beaches. To monitor SST, temperature loggers (HOBO Water Temp Pro v2, United States) were deployed at a depth of 5–6 m in April 2013 to April 2014 at two sites, Taka Fadelan reef (No. 1 in Figure 1) and Ocean Base (No. 2 in Figure 1). During logger deployment, the occurrence of multi-specific spawning was recorded and the daily amplitude of temperature variation was plotted. For 2012, SST was estimated by modeling variation in diurnal SST (DSST). The amplitude of DSST at a depth of about 1 m (ΔSST) was estimated from solar radiation (SR), wind speed (WS), and latent heat (LH), following the parametric model of Kawai and Kawamura (2003). The ΔSST generated from this model was validated against buoy measurements for the tropics. The root-mean-square error and bias was less than 0.3°C and + 0.1°C, respectively (Kawai and Kawamura, 2003). where MS is the daily mean of SR (Wm-2); U is the daily mean of WS (ms-1); – Hl is the daily mean of latent heat flux (upward is negative, Wm-2); a, b, c, d are the regression coefficients; and e is a constant value of 300 Wm-2. MS and U data were obtained from NASA near real-time global radiation and meteorology web services. Solar energy flux and daily wind speed data with a grid resolution of 1 × 11 were acquired using this resource. Hl data were downloaded from OAFLUX2 each day with a grid resolution of 1 × 1. The data were collected from 2009 to 2012 for the coordinates of 5.84°S and 110.58°E. Rainfall data were obtained from the Indonesian Agency for Meteorology, Climatology and Geophysics (BMKG) Semarang Office and were recorded at the closest climate and meteorology station (6°58’S and 110°25’E). Wind-field data were extracted at 10 m above the water surface. A threshold of 6 ms-1 for wind velocity was chosen to allow comparison with the findings of van Woesik (2010), as significant waves begin to form when wind velocity is greater than 6 ms-1. Acropora hyacinthus, A. humilis, and A. gomezi are simultaneous hermaphrodites. They produce both types of gametes (oocytes and spermatocytes) within the same polyp. Only one gonad develops in each mesentery. The development of oocytes is illustrated in Figure 2. Mesenteries bearing stage I oocytes were found. Within the mesentery bearing oocytes, one vertically aligned row of oocytes was observed. Stage I oocytes appeared in June in all three species. Stage I oocytes ranged from 5 to 50 μm. Typically, stage I oocytes were irregularly shaped and round-edged. The cytoplasm was small and appeared dense and coarsely granular in all three species. The nucleus was similar in color to the cytoplasm, with a round, bright, and pink nucleolus. The nucleus membrane was difficult to distinguish (Figure 2A). In contrast, stage II oocytes were oval to round, ranging from 50 to 150 μm in diameter and exhibited an increase in cytoplasm volume (Figure 2B). Stage II oocytes were typically stained pink. The cytoplasm was finely or coarsely granular as lipid vesicles began to accumulate, indicating the onset of vitellogenesis. During stage III, oocyte size increased progressively, with diameters ranging from approximately 200 to 400 μm (Figure 2C). At this stage, the yolk was stained dark pink, with some staining purple. The yolk was loosely or coarsely granular and filled with lipid vesicles as vitellogenesis progressed. The nucleus was smooth and stained rose or pink, with a bright pink nucleolus. At this stage, the nucleus was positioned mostly in the middle of the cytoplasm. In some mid- and late- stage III oocytes, the nucleus began to shift position, moving from the center toward the periphery. During stage IV, the size of oocytes increased noticeably, with diameters ranging from approximately 400 to 800 μm (Figure 2D). Oocytes were scored as stage IV when the nucleus was positioned against, or adjacent to the vitelline membrane. The yolk was fairly homogeneous, and the nucleus was round to dome-shaped. The nucleolus, which was observed less often in sections, migrated within the nucleus, to reach a peripheral position. As stage IV progressed, the nucleus became more irregularly shaped (saddle to crescent-shaped) and indented (Figure 2D). A mature spermatocyte was observed as a “flower bouquet” arrangement, with light pink or lavender-tails aggregated in a generally uniform direction (Szmant-Froelich et al., 1985; Permata et al., 2000; Vargas-Ángel et al., 2006; Figure 2E). Figure 2. Photomicrographs of histological sections of Acropora humilis and A. hyacinthus tissues illustrating the gonadal arrangement in both species. (A) A. humilis. Stage I oocytes developed in a mesentery. One vertically aligned row of oocytes was observed. Stage I oocytes ranged between 5 and 50 μm. (B) A. humilis. Stage II oocytes were oval to round, ranging from 50 and 150 μm in diameter and exhibited an increase in cytoplasm volume. They typically stained pink. The cytoplasm appeared finely or coarsely granular as lipid vesicles began to accumulate, indicating the onset of vitellogenesis. (C) A. humilis. Stage III oocyte the yolk stained darker pink, with some staining mauve. The yolk was loosely or coarsely granular, and filled with lipid vesicles, as vitellogenesis progressed. The nucleus was smooth, and stained rose or pink, with a bright pink nucleolus. (D) A. humilis. Stage IV oocyte size increased dramatically, with the diameter ranging from approximately 400 to 800 μm. The yolk was fairly homogeneous and the nucleus was round to dome-shaped. The nucleolus, which was less often observed in sections, also migrated within the nucleus, reaching a peripheral position. (E) Spermaries of A. hyacinthus filled with spermatids and surrounded by a thin spermatogonial wall while stage IV spermary was characterized by a pink or lavender color of a tail. Bouquet arrangement was observed in a late stage of spermary. From July to March, A. gomezi contained mature oocytes, whereas mature oocytes were observed in A. hyacinthus from December to March. A. humilis only had mature oocytes in March (Figure 3). The onset of gametogenesis was similar in all three species. The development of oocytes in all three species occurred from June to March, around 6–10 months earlier than spermatogenesis (Figure 3). It was difficult to determine when spermatogenesis began in the three species, as samples were not collected from January to February due to weather constraints. In December, no spermatocytes were observed in any of the three species. However, by March all samples contained mature spermatocytes (Figure 3). In the male mesentery, a mixture of spermatocytes of different stages were found, suggesting that spermatogenesis occurred before March. Figure 3. Development of spermatocytes and oocytes in Acropora. Spermatocytes were present in samples collected in March (A) Oogenesis started in May and lasted until March. Peak maturation was observed in March and April prior to the spawning event (B) (10 – 20 colonies were sampled for each species). Acropora assemblages at Karimunjawa Archipelago showed a high degree of inter-specific reproductive seasonality. Mature oocytes were present during both biannual surveys of the first and the second periods, each year from 2009 to 2012. In total, 21 Acropora species were sampled across the 4 years of surveys (including A. hyacinthus, A. humilis, and A. gomezi) and were subject to histological analysis. A low number of colonies per species was encountered, because many species formed a large single-species thicket that could grow to more than 10 m in length. A. aspera, A. florida, A. muricata, A. gemmifera, A. gomezi, A. humilis, A. hyacinthus, A. jacquelineae, A. loripes, A. millepora, A. nasuta, and A. tenuis contained mature eggs in March–April. In comparison, A. austera, A. carduus, A. caroliniana, A. muricata, A. humilis, A. kimbeensis, A. millepora, and A. tenuis contained mature eggs during September–October (Table 2). During each sampling period, 5–10 species contained mature eggs, with 16 to 71 colonies containing mature eggs (Table 2). A. muricata, A. humilis, A. millepora, and A. tenuis had mature colonies in March–April and September–October (Table 2). Brown colonies of A. millepora contained mature oocytes in October, while pink, blue, and green colonies contained mature oocytes in March. Two species, A. abrolhosensis and A. horrida, were encountered during sampling, but neither contained mature or immature eggs. A. muricata and A. gomezi were also encountered and always contained at least one mature colony during the first transition period in each year for all surveys. A. tenuis was the only species that contained mature colonies in March–April and September–October in surveys across all years (Table 2). Table 2. Overview of observed coral colonies. Direct observations of the reefs showed that most of the corals spawned gametes several hours after dusk (Table 3). Gametes were released over several hours. Slicks started to disperse within 1 to 2 h of the onset of spawning. A. gomezi spawned gametes between 19:00 to 22:00, while A. austera, A. gemmifera, and A. tenuis spawned gametes at around 22:00. In March–April, spawning occurred between 3 and 9 days before the full moon. In comparison, in September–October, coral populations released gametes 1 day before or after the full moon. 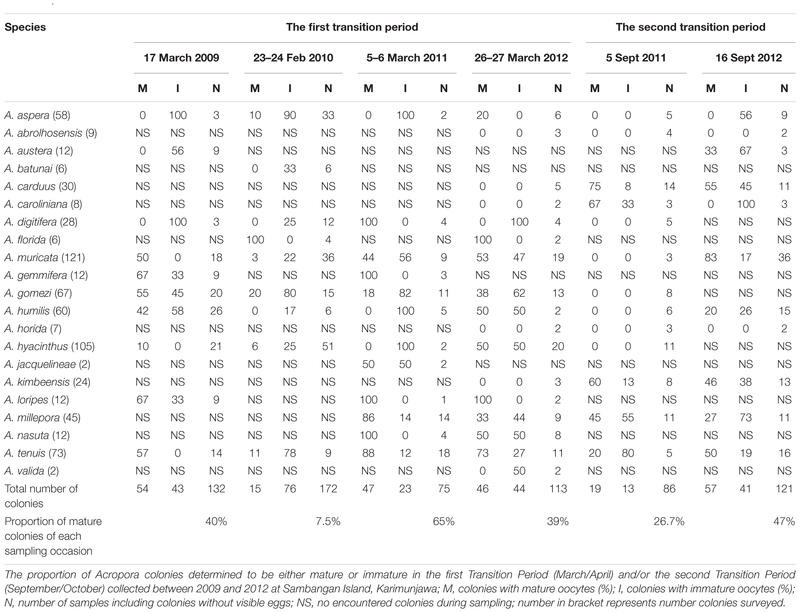 There was no difference in the time of the day of spawning between the first transition period (March–April) and the second transition period (September–October) (Table 3). Table 3. Dates and times of spawning slicks at Sambangan Island, Karimunjawa between 2009 and 2012 with respect to the full moon and time of spawning; NBF, nights before full moon; NAF, nights after full moon; see Section “Materials and Methods” for details of observation. Gamete release within a given month lasted between one and 7 days; however, the colonies did not necessarily spawn on consecutive days. Indeed, spawning was sometimes split over several days or weeks, specifically March–April 2009 and 2012, and September–October 2012 (Table 3). Therefore, spawning might have occurred on additional days. For example, in 2009, spawning was detected 13 days after initial spawning. In 2012, the first spawning event that occurred on 1–3 April was followed by another multi-specific spawning event on April 8, which was detected from the slicks that were deposited on the beach. Split spawning was also observed in October 2012. The first spawning event was observed on October 3, while the second spawning event occurred 27 days later, when the slicks were found (Table 3). Sea surface temperature – Data from the temperature loggers deployed on Taka Fadelan and Ocean Base showed two periods of temperature rise. The first period occurred in September–November 2013 and the second period occurred in March–April 2014. The daily amplitude in temperature during the first period at Taka Fadelan and Ocean Base was 2.22°C and 2.65°C, respectively. During the second period, it ranged from 2.22 and 2.70°C, respectively (Figure 4A). 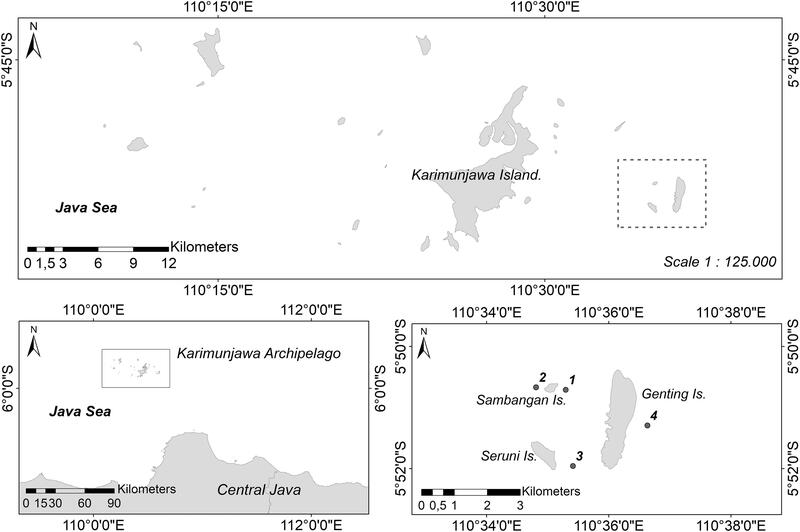 Multi-specific spawning events at Sambangan Island occurred between March 26, 2013, and May 20, 2014, at 28.54–30.14°C. On September 20, 2013, spawning occurred at 28.54–28.68°C. On October 20, 2013, spawning occurred at 29.86–29.89°C. The multi-specific spawning event that was observed on April 19, 2014, occurred at 29.81–30.14°C (Figure 4B). Figure 4. Full year temperature profile at Karimunjawa Archipelago obtained from temperature loggers that were deployed at Taka Fadelan (05°50′ 42.5′′ S, 110° 35′ 17.7′′ E) and Ocean Base (05°50′ 40.1′′ S, 110° 34′ 48.5′′ E). Two periods of increasing temperature were observed, during the first transition period (March – April) and the second period (September – October) (A). Spawning occurred during increasing SST and appeared to follow the lunar cycle; the triangle represents the spawning event (B). 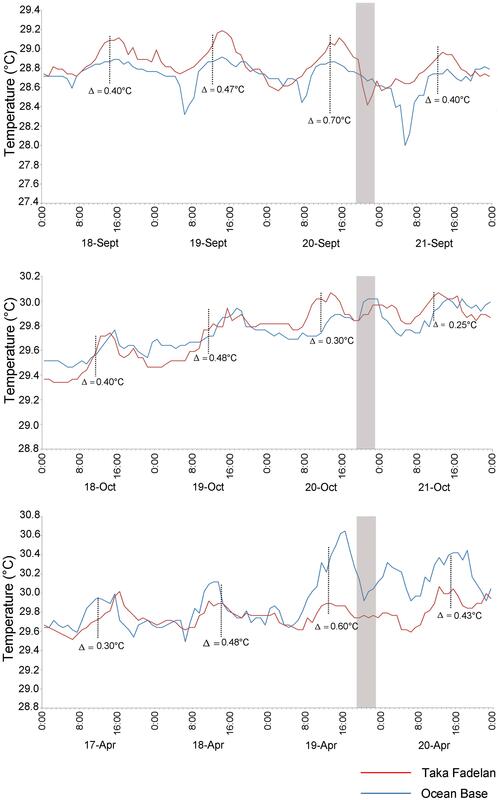 Several hours before spawning (19:00–22:00) on September 20, 2013, when a multi-specific spawning event occurred, the temperature decreased at Taka Fadelan, and a smaller decrease in temperature at Ocean Base (Figure 5). On the expected spawning day of October 20, 2013, a rise in temperature was observed. Temperature showed an upward trend from October 18 to 21, 2013, but a pronounced temperature rise was only observed on October 20, 2013. Variation in DSST before multi-specific spawning on April 19, 2014, included a distinct drop in temperature at Ocean Base after exposure to a fairly noticeable rise in temperature from 14:00 to 15:00. The same pattern of temperature change was observed at Taka Fadelan on this date, but no pronounced fluctuations were recorded (Figure 5). Figure 5. Diurnal temperature variations prior to multi-specific spawning on 20 September, 20 October 2013, and 19 April 2014. The gray area represents the expected spawning time. Blue line represent Ocean Base, Red line represent Taka Fadelan. A model of variation in DSST showed that variation in ΔSST followed variability in MS, the daily mean of SR and U, and the daily mean of WS. Higher MS and lower U resulted in higher ΔSST. Latent heat was not plotted, as it did not have a pronounced influence on variation in ΔSST. Figure 6 shows that corals always spawned during or immediately after a period of high ΔSST (>0.5°C). A strong signal was found for the spawning periods on March 20, 2009, April 3, 2009, October 25, 2010, March 17–19, 2011, April 1–3, 2012, and October 3, 2012, when ΔSST reached at least 1.0°C (with October 2011 showing a less pronounced link). Figure 6. Truncated time series of a daily average of solar radiation (W/m2/day), wind speed (m/sec), and amplitude of DSST (°C) obtained from equation (1) at 5.840S,110.580E, with the corresponding spawning time. The dates of multi-specific spawning are in March–April, and September – October, and are indicated by the triangle mark. Total monthly rainfall –SST, and to a lesser extent rainfall, showed a distinct seasonal pattern at our study site (Supplementary File S2). The pattern of rainfall was seasonal in three of the 4 years of our study. In 2010, rainfall exhibited a less distinct seasonal pattern than SST (Supplementary File S2). 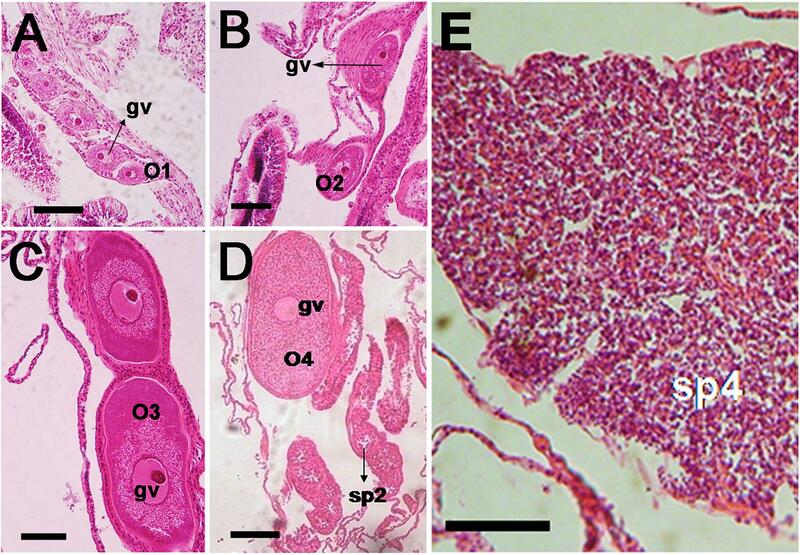 The histological observations showed that the gametogenic cycle of Acropora hyacinthus, A. humilis, and A. gomezi followed a similar timing. All three Acropora species contained oocytes of various stages from June 2008 to March 2009, with maturing oocytes occurring in March. All three Acropora species probably had a single gametogenic cycle. A. gomezi colonies with mature oocytes were found monthly from July 2008 to March 2009 of the following year. In comparison, A. hyacinthus had some stage III oocytes in September, but only stage II oocytes in October; thus, mature oocytes might have been released during that time (Figure 3). Colonies of A. humilis contained mature oocytes on September and every month thereafter (Figure 3). However, spermatocytes were not found in December 2008, or earlier, in any of the three species, and were first observed in samples collected during March 2009 (Figure 3). Spermatogenesis might have started earlier than March in all three species. However, before the second transition period (December to February), a strong current passed through Karimunjawa waters, preventing the collection of samples. The synchrony of gamete maturation in the Acropora assemblages of Karimunjawa Archipelago seems to be moderate. The proportion of mature colonies was comparable between the first (March–April) and second (September–October) transition periods, ranging from 0.08 to 65% and from 26.7 to 47%, respectively. A. aspera, A. batunai, A. digitifera, A. gomezi, A. humilis, A, muricata, A. hyacinthus, and A. tenuis showed a low proportion of mature gametes during the sampling period in February. Likely the sampling time was early thus only immature oocytes were present. Field surveys indicated that 12 Acropora species (namely, A. aspera, A. florida, A. muricata, A. gemmifera, A. gomezi, A. humilis, A. hyacinthus, A. jacquelineae, A. loripes, A. millepora, A. nasuta, and A. tenuis) contained mature eggs in March–April. In comparison, 8 Acropora species (A. austera, A. carduus, A. caroliniana, A. muricata, A. humilis, A. kimbeensis, A. millepora, and A. tenuis) contained mature eggs during September–October (Table 2). Compared to surveys in the central GBR (Baird et al., 2009), the proportion of mature colonies during both spawning periods was lower. However, the proportion of colonies breeding in March 2011 was slightly higher (65%) compared to the northern GBR (63%) (Baird et al., 2002). The proportion of mature colonies was about 40%, which was similar to that obtained for reefs in Singapore (Guest et al., 2005a). Within species, a high synchrony in oocyte maturation was observed for Acropora gomezi, A. muricata, A. millepora, and A. tenuis (Table 2). Guest et al. (2005a) reported that, in April 2003, 12% of 8 A. tenuis colonies in reefs in Singapore contained mature oocytes. In comparison, 17% (n = 6) to 88% (n = 17) of A. tenuis in the Karimunjawa Archipelago contained mature oocytes in our study. A. muricata also showed high synchrony of gamete maturity during both sampling periods, with the highest proportion of mature colonies in September 2012 (83%; n = 36). This result differs to that of other species. 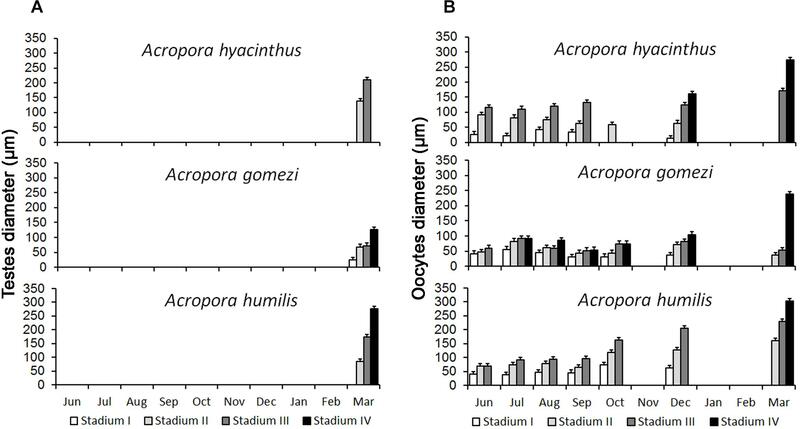 In particular, A. humilis and A. aspera both contained high proportions of immature oocytes (Table 2) and might have spawned in different months. In Singapore (Guest et al., 2005a), 86% (n = 7) of A. humilis showed synchrony in gamete maturation, while, in New Caledonia (Baird et al., 2010), many A. humilis colonies lacked visible eggs. The lack of oocytes arose because colonies directed their energy toward growth likely counteracting environmental stressful conditions (Baird et al., 2010). In the present study, A. carduus, A. kimbeensis, and A. millepora only exhibited a high proportion of mature eggs during the second transition period. A. hyacinthus, A. muricata, A. millepora, and A. tenuis contained mature and immature oocytes in March–April and September–October (Table 2). Edinger et al. (1996) reported that 22 species of scleractinian corals spawned in October in the Karimunjawa Archipelago, including A. hyacinthus. Biannual multi-specific spawning at the same location has been reported for coral assemblages that spawn their gametes in March–April and October–November (Permata et al., 2012). The oocytes of different morphotypes of A. millepora matured at different periods. Pink, blue, and green colonies had mature oocytes in March, while brown colonies had mature eggs in October. These findings correspond well with the literature. Rosser (2013) found that A. millepora in the waters off western Australia spawn in different seasons. In Singapore, two distinct periods of coral spawning have been reported for A. humilis containing mature eggs in October and November, and again in April (Guest et al., 2005a). Furthermore, in the GBR, Montipora corals exhibit biannual spawning, in spring and fall, with some colonies undergoing two gametogenic cycles (Stobart et al., 1992). Coral populations in north-western Australia also spawn during spring and fall. Of seven species studied over two spawning events, five only spawned during fall and one released its gametes in spring (Gilmour J. et al., 2016). In the northern region of Western Australia, coral species spawn during spring at Ashmore Reef, whereas A. millepora spawns in fall at Ningaloo Reef (Rosser, 2013). Favorable conditions (Harrison and Wallace, 1990), a genetic legacy (Babcock et al., 1994), and natural selection (Rosser, 2013) might explain why certain coral spawn in spring or fall, or why some species have a second gametogenic cycle. Long-term research on corals has advanced our understanding of the environmental cues that dictate the month, day, and hour of spawning (Babcock et al., 1986; Hunter, 1988) and provides further cues about split spawning. For instance, the spawning patterns of corals in the Karimunjawa Archipelago appear to follow the lunar cycle (Table 3). Many corals species exhibit synchronous spawning according to lunar phases (Harrison and Wallace, 1990). Corals have extraordinarily sensitive photoreception, in terms of their ability to sense the blue region of the lunar spectrum; thus, corals are able to detect the intensity of moonlight (Gorbunov and Falkowski, 2002). However, in some spawning events observed in the present study (March 2009; April 2012; October 2012), split spawning occurred over an extended period, ranging from 8 days before full moon to 9 days after full moon in March 2009 and 7 days before full moon and 1 day after full moon in April 2012. In comparison, spawning occurred 2 days after full moon followed by the second spawning event 1 day before full moon in October 2012 (Table 3). One possible explanation for this variation is that when coral populations divide spawning over two consecutive months, the annual reproductive rhythm is affected by the number of lunar months, either 12 or 13 (Baird et al., 2009). There were 13 lunar months in both 2009 and 2012. Indeed, split spawning might be necessary in years with 13 lunar months to maintain an optimal environmental window for coral reproduction (Baird et al., 2009; Foster et al., 2018). Nozawa et al. (2006) suggested that the shift in the timing of spawning with respect to lunar months is related to the history of seawater temperature immediately before spawning. In terms of the hour of spawning, during the 4 years of our study, all tagged colonies released gametes 1–2 h after dusk during the first and second transition period. For broadcast spawning corals, most species spawn after the onset of darkness (Babcock et al., 1986; Hunter, 1988). Similar behavior was observed in southern Japan and Palau, where Acropora species spawn at around 19:00–20:00 (Fukami et al., 2003; Levitan et al., 2004). Empty colonies (i.e., colonies with no visible gametes) were observed in all 4 years of sampling. These colonies might have spawned earlier, or they might be sterile (Baird et al., 2010). Alternatively, these colonies might breed at other times of the year, outside of the observed annual gametogenic cycle. Synchronization might be maintained by similar responses to a range of environmental signals, such as sea temperature patterns, lunar and tidal cycles, and diurnal changes to solar insolation, which work in concert to regulate the maturation and spawning of gametes (Babcock et al., 1986). Global comparisons between coral spawning times and SSTs are not always consistent. Coral spawning in Western Australia does not coincide with the maximum annual water temperature (Babcock et al., 1994). Penland et al. (2004) have also questioned the relationship between coral spawning and tropical water temperatures in Palau. Similarly, in a meta-analysis testing the relationship between solar insolation cycles and the timing of synchronous coral spawning, van Woesik et al. (2006) found a positive correlation. Insolation might be a more effective predictor of the timing of spawning than SSTs in the western Pacific Ocean (Penland et al., 2004) and western Atlantic Ocean (van Woesik et al., 2006). However, a recent study assimilating data on reproduction conditions in reefs throughout the Indo-Pacific region showed that the best predictor for the peak month of spawning in Acropora assemblages is a rapid change in SST (Keith et al., 2016). 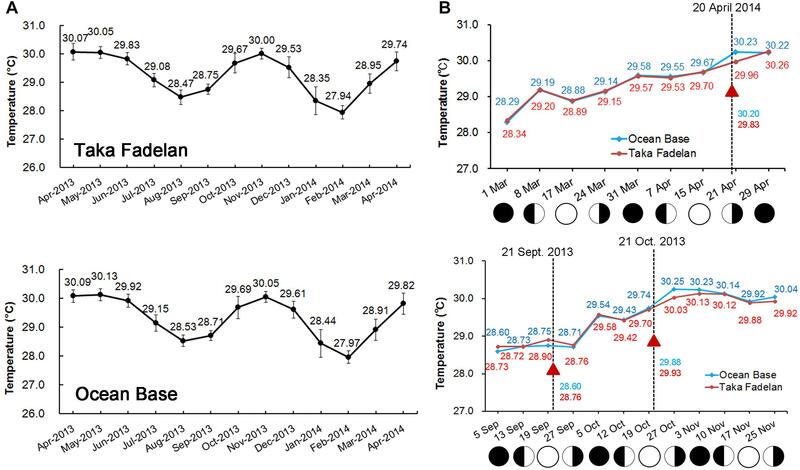 Our study also documented two distinct spawning seasons in 2013 and 2014, which might correlate with two periods of rising temperature in September–November 2013 and March–April 2014 (Figure 4). Temperature might control the timing of spawning by initiating the development of testes, with coral populations in inshore reefs being likely to spawn earlier, coinciding with an earlier and more rapid rise in temperature (Babcock et al., 1986). In addition, our histological observations confirmed the presence of spermatocytes in March only (Figure 3), during a period of rising temperature. We recorded a significant decrease in temperature several hours before multi-specific spawning. This phenomenon occurred on the expected date of multi-specific spawning in both March–April and September October (Figure 5). 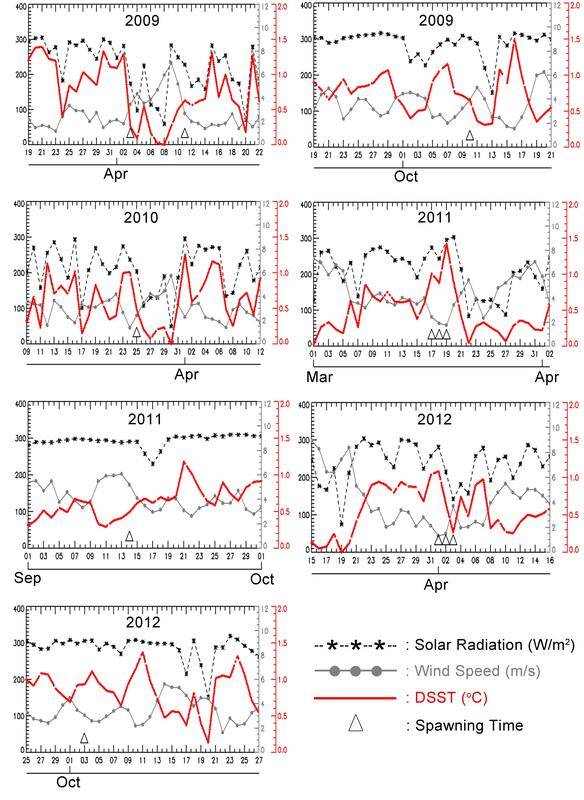 The modeled DSST (Figure 6) showed that daily solar radiation coupled with wind speed affected the amplitude of DSST. During the first (March–April) and second (September–October) transition period, the wind speed was lower, while the temperature increased (Figure 6). The same pattern was observed in data collected from temperature loggers around Genting Island, which is adjacent to Sambangan Island. This pattern commonly occurs in the Java Sea, as observed by Wirasatriya et al. (2018). Put differently, transition periods in the Java Sea are characterized by low wind speed, which leads to an increase in SST. During the transition periods, the daily temperature was probably affected by wind speed, daily insolation, and rainfall. A rise in temperature was followed by lower wind speed and an increase in the Insolation Clearness Index (Arfiyan and Munasik, 2016). Lower wind speed coupled with a significant decrease in temperature before the spawning date during a rising temperature period might provide the ultimate cue for the timing of multi-specific spawning among the coral population in the Karimunjawa Archipelago. These findings support those reported by van Woesik et al. (2006) and van Woesik (2010), who documented that spawning events occur during periods of low wind speed and high insolation. Our results also support the concept that these conditions generate high ΔSST, which might act as the natural trigger for corals to release gametes. Thus, ΔSST might be a better predictor for coral spawning than SST, as SST displays inconsistencies with the timing of spawning in corals at some sites (Keith et al., 2016). However, the findings of this study require validation, as the data used here had low spatial resolution (1°× 1), and ΔSST was predicted at a depth of just 1 m. Therefore, more in-situ data of ΔSST, or a higher resolution SST dataset, is needed in future studies to understand how ΔSST influences coral spawning events. Wirasatriya et al. (2019) showed that high resolution SST datasets (i.e., 1 km × 1 km) can capture an amplitude of ΔSST of more than 5°C, even in higher latitude areas, i.e., around 40°N. Furthermore, laboratory experiments could be used to identify the ΔSST at which coral spawning is triggered more accurately. In the present study, when the timing of spawning was connected with a period of rainfall, most coral species spawned just after the period of heaviest rainfall during the first transition period and before the heaviest rainfalls during the second transition period in all 4 years (Supplementary File S2). Mendes and Woodley (2002) suggested that spawning outside a period of heavy rainfall increases the fertilization rate. During periods with the heaviest rainfall, the level of nutrient influx from river run-off increases, which might reduce the successful development and settlement of coral larvae. Moreover, Hédouin et al. (2015) showed that rainfall on the night of coral spawning kills 70% of gametes released when salinity decreases to 26%. The present study reported similar patterns to those reported by Guest et al. (2012) in Singapore; specifically, coral spawning occurred before the period of heaviest rainfall. The present study demonstrates that spawning in equatorial and tropical regions might be controlled by a drop in temperature several hours before spawning begins during periods when temperatures are rising. These results support the findings of Keith et al. (2016), with the rate of change in SST potentially representing a better predictor of multi-specific spawning throughout the Indo-Pacific region. The change in SST during periods of temperature rise coupled with lower winds might provide favorable conditions for multi-specific coral spawning. In addition, a drop in temperature during the period of rising temperature might help corals to adapt the timing of reproduction to the future effects of climate change. Corals that have experienced such shifts in phenology might have benefits compared with those that rely on certain absolute environmental cues for reproductive timing (Parmesan and Yohe, 2003). Additional research is required to investigate the relationship between drop in temperature during periods of rising temperature and the timing of multi-specific coral spawning in the tropics in more detail, as well as the potential involvement of other proximate cues. The study was conducted at a cluster of island resort managed by PT Pura Baruna Lestari. Most corals that were sampled were collected for further laboratory observation. We cut small branches for studying the gametogenesis and reproductive status of the corals. DW and EI designed the study. AW modeled the Figure 6. AH and DH led the fieldwork with Marine Diving Club members. AS conducted the histological study. TF analyzed the temperature data obtained from the loggers. RB helped to design the study. DW conducted the analyses and wrote the manuscript with assistance from EI, DH, and RB. We thank Dr. C Starger and Dr. Y Nozawa for reading an earlier version of the manuscript. We thank Dr. AH Baird for his suggestion on sample collection. We thank Professor Peter Harrison for his valuable correction throughout the manuscript. Special thanks go to Andhika Prabowo, Ertha Ankgusuma and the member of Marine Diving Club, Diponegoro University for assistance with fieldwork. We thank PT. Pura Baruna Wisata, Coral Unit for logistic support during sampling in Sambangan Island. We also thank NASA Climatology Resource Near real-time Global radiation and Meteorology (http://power.larc.nasa.gov/) and WHOI OAFlux project (http://oaflux.whoi.edu) funded by the NOAA Climate Observations and Monitoring (COM) program for providing the atmospheric and radiation data. This study was funded by Competition Grant provided by Indonesia Directorate General of Higher Education No. 381/SP2H/PP/DP2M/VI/2010 (year 2010) and No. 353/SP2H/PL/Dit.Litabmas/IV/2011 (year 2011), Diponegoro University Research Grant on International Publication No. 186-02/UN7.5.1/PG/2016 (year 2016) and No. SP DIPA-042.01.2.4.400898/2016 (year 2016). Bachtiar, I. (2001). Reproduction of three scleractinian corals (Acropora cytherea, A. nobilis, Hydnophora rigida) in eastern Lombok Strait, Indonesia. Indones. J. Mar. Sci. 21, 18–27. Baird, A. H., Marshall, P. A., and Wolstenholme, J. (2002). Latitudinal variation in the reproduction of Acropora in the Coral Sea. in Proceedings of the 9th International Coral Reef Symposium, Bali. 1. Burke, L., Selig, L., and Spalding, M. (2002). Reefs at Risk in Southeast Asia. Washington, DC: World Resources Institute. Edinger, E. N., Azhar, I., Mallchok, W. E., and Setyadi, E. G. (1996). “Mass spawning of reef corals in the Java Sea, Indonesia,” in Proceeding of the 8th International Coral Reef Symposium, (Panama, PM), 57. Guest, J. R., Chou, L. M., Baird, A. H., and Goh, B. P. L. (2002). Multispecific synchronous coral spawning in Singapore. Coral Reefs 21, 422–423. Guest, J. R.,and Goh, B. (2012). Reproductive seasonality of the reef building coral Platygyra pini on Singapore’s reefs. Raffles Bull. Zool. 123–131. Harrison, P. L., and Wallace, C. C. (1990). Reproduction, Dispersal and Recruitment of Scleractinian Corals. Ecosystems of the World. Amsterdam: Elsevier. Hunter, C. L. (1988). Environmantal cues controlling spawning in two Hawaiian corals. Montipora verrucosa and M. dilatata. in Proceedings of the 6th International Coral Reef Symposium, Townsville, QLD. 727–732. Oliver, J. K., Babcock, R. C., Harrison, P. L., and Willis, B. L. (1988). Geographic extent of mass coral spawning: clues to ultimate causal factors. in Proceedings of the 6th International Coral Reef Symposium,Townsville, QLD 2, 803–810. Stobart, B., Babcock, R. C., and Willis, B. L. (1992). Biannual spawning of three species of scleractinian coral from the great barrier reef. in: R. H. Richmond (ed.) Proceedings of the 7th International Coral Reef Symposium, Vol. 1. Guam: University of Guam. 494–499. Szmant-Froelich, A. M., Reutter, M., and Riggs, L. (1985). Sexual reproduction of Favia fragum (Esper): lunar patterns of gametogenesis, embryogenesis, and planulation in Puerto Rico. Bull. Mar. Sci. 37, 880–892. Tomascik, T., Mah, A. J., Nontij, A., and Moosa, M. K. (1997). The Ecology of the Indonesian Seas. North Clarendon, VT: Periplus Edition (HK) Ltd, 642. Willis, B. L., Babcock, R. C., Harrison, P. L., and Oliver, J. K. (1985). Patterns in the mass spawning of corals on the great barrier reef from 1981 to 1984. in Proceedings of the Fifth International Coral Reef Congress, Tahiti, 343–348. Copyright © 2019 Wijayanti, Indrayanti, Wirasatriya, Haryanto, Haryanti, Sembiring, Fajrianzah and Bhagooli. This is an open-access article distributed under the terms of the Creative Commons Attribution License (CC BY). The use, distribution or reproduction in other forums is permitted, provided the original author(s) and the copyright owner(s) are credited and that the original publication in this journal is cited, in accordance with accepted academic practice. No use, distribution or reproduction is permitted which does not comply with these terms.